Yes, we do more than custom t-shirts and logo apparel. We also provide custom plaques and other cool shwag that continues to grow in popularity and making Kirkwood Trading Company your one stop shop. 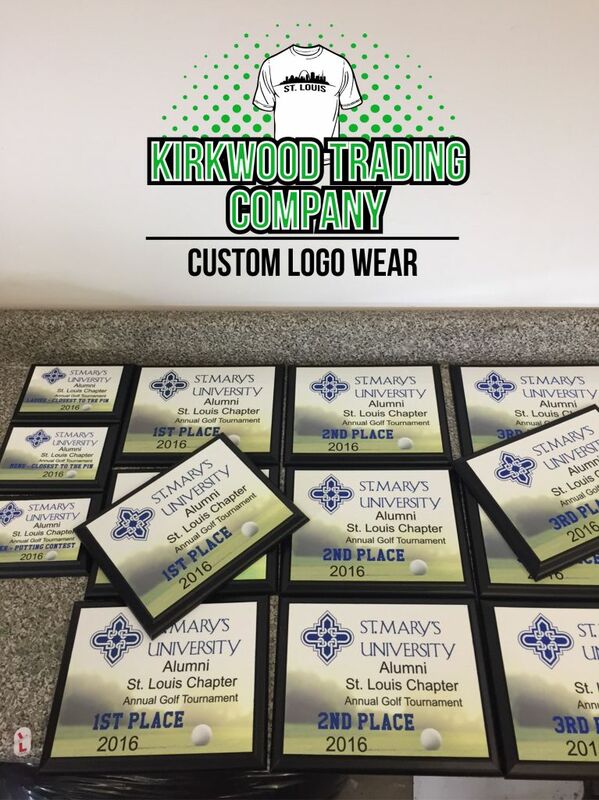 We recently did two sets of award plaques for a big golf tournament that requested plaques for 1st, 2nd, and 3rd place prizes as well as closet to the pin and long drive plaques. They were well receieved and already booked for future golf tournaments. We have also worked with many area golf courses to provide them with hole in one plaques when one of their members is fortunate enough to experience that. Kirkwood Trading Company also was recently commissioned to provide custom plaques for a celebrity charity event where the major donors were awarded with custom plaques for the event. They were a big hit and custom plaques are such a nice commemorative gift that lasts forever. We offer custom plaques in a variet sizes and styles that come in both black wood trim and cherry wood trim. The two most popular finishes. The nice thing about custom plaques is that because it’s done with a dye sublimation process, the print literally lasts forever. They are scratch proof and UV proof so you truly have a gift or award that lasts a lifetime. In standing with Kirkwood Trading Companies policy of performing all of our printing in-house, these custom plaques and awards are no different. So you can expect the most expert quality available at a fair price. Whether you need 1 custom plaque or a thousand, contact us and we’ll be happy to see what your needs are and cater a printing solution to fit that need. Typically custom plaques can be printed and ready to go inside a week. So the lead time is fast.